A national report presenting the results of a WHO European Childhood Obesity Surveillance Initiative (COSI) study in Kazakhstan was recently released. This was the first time the country participated in the study. It found that around 20% of 8- and 9-year-old children were overweight and 6% were obese. In addition, it showed clear differences in prevalence according to gender and place of residence. For example, boys living in urban areas tended to be more overweight or obese than boys living in rural settings. The National Centre for Problems of Healthy Lifestyle Development of the Ministry of Health implemented the COSI study. It involved taking body measurements of third- and fourth-grade students, collecting information on their eating behaviours and physical activity habits, and collecting self-reported information on the body mass indexes and socioeconomic situations of their parents. 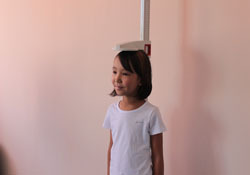 This important report provides a baseline for further assessments, and has already helped to identify specific factors associated with childhood overweight and obesity in Kazakhstan. It will empower advocates of policies to reduce childhood overweight and obesity, and enable policy-makers to design better and more cost-effective strategies and interventions to address the problem. The environments to which children are exposed play a crucial role in the development of this epidemic. Sugary drinks and sweet and savoury snacks in schools, for example, can adversely affect the health of children. It is important that a multifaceted approach is taken to creating healthy school environments. This involves establishing standards for meals provided in schools, controlling the foods and beverages that are available to children, and including nutrition and health education within the core curriculum. In addition, whole-of-government action is needed to reduce levels of overweight and obesity through the primary health-care system, the sports sector and community-based interventions targeting the entire family. The full results of the study can be accessed in Russian. An English summary of key findings is also available.